The Network Status Display form is used to set up networking of multiple PCs to a common data file. If you are running your software 'Stand Alone', there is nothing that you'll need to configure here. If you are interested in networking N3FJP software for a multi op contest, DXPedition or you just want to access your log from multiple PCs simultaneously at your home or club station, please read on! There's lots of explanation below, including how to network your PCs, enable the band status and messaging. If you are setting up for Field Day it is a MUST READ, but in short, to network multiple PCs, simply put your log file in a location that is accessible to all the PCs you wish to network by clicking File > Save As. Then, from the other PCs, click File > Open, navigate to the file and select it. Any contacts you enter should appear on all PCs in a minute or less (depending on the refresh rate you set). That's all there is to it! Here is a video overview of how to set up networking with all my contesting software and Amateur Contact Log too. For the rest of the story, some of the emphasis is on Field Day as that environment is the ultimate test of any network, but the information below applies to networking all of my software. There are now two methods for networking my software - File Share and TCP. File Share has been used very successfully since I first introduced the networking versions of my software in the late 1990s with the vast majority of users. I added TCP in July, 2013 as a second networking option that should help the few groups who encountered file share problems resulting from slow network connections and / or intermittent network connectivity. Following Field Day 2013, I received lots of great reports from the vast majority of groups who networked with File Share using my new C# rewrite (Field Day Contest Log 4.0), but I did receive a few reports from a very small percentage of folks (only 7 groups, but that is 7 too many), who had intermittent problems with the program occasionally or frequently reporting 'unable to execute the SQL command'. To read more user feedback for Field Day 2013, please click here. It appears that these problems were related to intermittent network connectivity, power surges (one group specifically reported all was fine until they experienced a power surge) and / or RF interference. Other possible causes include Windows firewall restricting access and anti virus software delaying the communication and resulting in timeouts, which becomes more likely when using wireless. Access Requirements, Stable Networks and Field Day Challenges! Access databases require solid, fast, uninterrupted networks to work properly. If even one of your networked PCs has a slow / intermittent connection, all the PCs will suffer, waiting their turn and eventually timing out, as the database struggles to service the problem PC. Several groups commented that as soon as they found and fixed the problem PC, everything came to life and worked great. Networking in environments such as Field Day with the potential for power surges from generators, lots of stray RF, wireless connections near the end of the transmitter range, intermittent connectivity drops for any number of reasons, PCs of sometimes questionable performance with multiple flavors of virus protection / Internet security software, using temporary, untested network setups is challenging! In addition to your operating skills, Field Day will fully test the performance of your network too! The TCP method overcomes the delayed file share response problem since only one PC is actually connected to the file with the TCP method, ideally on its local hard drive. This eliminates file network communication and sharing delays. That said, even TCP can't overcome a network environment that is so unstable that even TCP communications become unreliable. While the TCP option may be more forgiving, a reasonably stable network is required for any networking option! Following Field Day 2014, I've received lots of great reports on both File Share and TCP! I did not receive a single report of consistent problems from anyone entering data using File Share, so it appears everyone did a great job setting up fast, reliable networks in 2014! TCP also faired very well in 2014, with only two problem reports. One group networked 10 PCs via TCP and found their server would occasionally lock up. They switched to a faster PC for the server and everything worked fine. Another group networked at least 16 PCs. They also found the server to lock, so they switched to File Share. TCP requires more of the server, so make sure you select your fastest PC, with plenty of processing power and RAM to perform that function. - The tried and true, most extensively tested method, proven to work fine, supporting multiple connections on stable, fast networks that have NO DROP in connectivity. - All PCs must select the same networking method. You can not mix and match! Either use File Share or TCP for every PC. - All PCs must enable the Status and Chat functions, which connect to the server on port 1000. If you have virus / Internet protection software, you must set your protection software on the server and EVERY client to allow this program to communicate on port 1000. - The server should host the file locally on its hard drive, not over the network, to eliminate any possibility of network file access delays. Choose your PC with the fastest processor and most RAM for the server. - ONLY the SERVER will and have the ability to perform many of the File menu options. This can be an advantage or disadvantage, depending on which functions you want the clients to be able to perform. - If your Network Status Display Form version reads 1.2 or later, in addition to the server, the TCP clients can also be set to write backups. For file share, to network multiple PCs, sharing and updating a common log file from multiple clients simultaneously, from the main form, simply click File > New > Start a New Contest with a New Database and save the file to a location that is accessible to all the PCs on your network. From the other PCs, click File > Open, navigate to the file you just created and select it. That's all there is to it! Every PC should see a QSO entered from any client within one minute or less, depending on your refresh rate and provided there isn't a value being typed in the call field. If one or more of your clients are unable to update the database, make sure you have enabled the proper sharing and permissions, etc. If a client can see the database and read records, but can't add any, it is likely that your permissions for either the log file, the folder and / or drive on which it resides are set to Read, not Update. Changing your permissions to Update will correct that. You'll find more information on fixing common SQL file errors here. For more information on how to enable sharing, please Google 'Setting up a Home Network'. Notice that you haven't touched any of the settings on the Network display form. If you just want to share the data file, see all the contacts that everyone logs and get a continually updated, current combined score for all the stations, you've already done all you have to do for File Share! You don't have to enable the Status / Chat functions for File Share, but you will likely want to. That way you can see what bands other folks are on at a glance, send messages and get band overlap alerts. Please see the Enabling Band Status and Chat Functions section below. Then click the TCP networking method option and check the Enable Status / Chat functions as shown here. Note, if you forget to also set your server to TCP and erroneously leave it on File Share, it will appear that you are logging contacts on your clients when you press enter, but they are not being saved anywhere. The server is relaying the ads by TCP as it does with all TCP data, but thinks you are in File Share, so it expects the clients to be adding the records to the file. Conversely, the clients think the server is saving their data, since they are in TCP mode. To be sure you are set up properly, enter some test data in a client, close the program, reopen it and see if your data appears. All PCs must select the same networking method. You can not mix and match! The Network Status Display form provides a display of the stations on each band and the ability to send a chat message. The functions this form provides are not required for File Share networking and can remain disabled for File Share, but they are REQUIRED for TCP Networking. - You can follow the graphics for Setting Up TCP above. All will be identical unless you are using the file share method, in which case you would select File Share instead of TCP. - Enter any name that you would like this station to be called in This Station's Name field (for TCP Networking, the server name and station name MUST be identical). - Enter the exact name of the PC that will be used as the message server in the Server Name field (not the station name the server is using to identify itself if different (the server can't use an alternate name in TCP mode)). With the file share method, to set the message server to the same PC that is hosting the log file, click Set Message Server to Log File Host. If the button is disabled, it is already set to the PC hosting the log file. The PC hosting the log file and the PC acting as the message server can be different PCs with file share, but should be the same for TCP. - Click the Enable Status / Chat Functions check box. - If all is set correctly, you will connect to the server, or if this PC is acting as the server, you should see the clients connect within 1 minute. If for any reason you don't, click in the Server Name field (that will disable the attempt), correct it accordingly and then click the enable checkbox again. - Connections are on port 1000, so if you have any trouble connecting, make sure your virus protection software is allowing the connection (on both server and client machines). - If the server is turned off, the clients will recognize that within one minute and attempt to reconnect automatically. - To send a message, type your message in the message field and then press enter. All messages are seen on all PCs regardless of the Message To field; however, a message box will only appear on the main form of the receiving PC if the Message To field either identifies that station or is left blank. 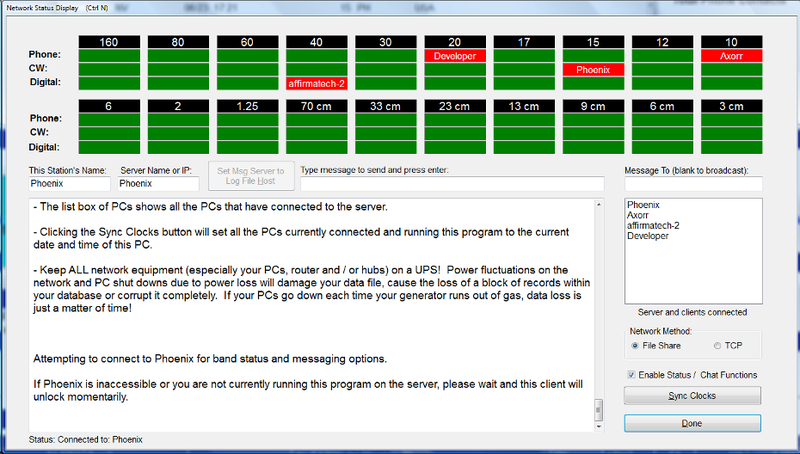 When blank, a broadcast message is assumed and the message box will appear on the main form of all the PCs. - The list box of PCs shows all the PCs that have connected to the server. - Clicking the Sync Clocks button will set all the PCs currently connected and running this program to the current date and time of this PC if they have enabled the Status / Chat function. Note that the software must be running with Administrator privileges on all systems for this function to work with later operating systems. - If you are unable to log any contacts at all and consistently receive "unable to execute SQL Command", your folder permissions are set to read, so you can see the file, but not update. Setting your permissions properly will correct that. - With later operating systems, groups often find it easier to attach and share an external hard drive or thumb drive to their server, than share their server's C drive. - TCP Networking is NOT recommended for Amateur Contact Log. For proper functionality and to fully enjoy all the feature's of AC Log, please select File Share. - Don't wait until the Saturday morning of Field Day to install and test out the software on your network! If you haven't already done so, get the PCs together before Field Day, hook them up and make sure that each PC is able to access and update the common data file. Problems solved very easily in a relaxed atmosphere can seem insurmountable when the clock is ticking.